. Among the changes were some improvements to Forms. The most visible change makes the whole Forms feature more accessible to you, since "spreadsheets" isn't the first place you'd look to create a form. We noticed that many of you search for "Forms" from your Docs List and from within the other editors (documents, presentations). So, we've made Forms accessible directly from your Docs List in the "New" menu. 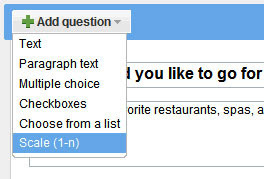 Next, we changed the Forms interface a bit to make it easier for you to add and edit the questions in a form while giving you more clues about the types of questions available. You can also delete a form completely now in addition to just turning it off (not accepting additional responses). 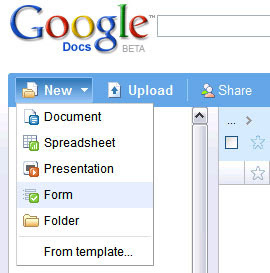 We also now identify each spreadsheet with a Form using a special icon on your Docs List. Moving out from under the shadow of its spreadsheet parent seems like a good step - but give us feedback if you've got other ideas. Just wait until Forms is old enough to drive... Oh, the places we'll go! We made a few improvements to the spreadsheets editor this week, which you can read about in our user group. Among the changes were some improvements to Forms.